At its quarterly work fellowship event on Saturday, September 23rd, Faith Lutheran Church in Lafayette, LA, held a painting party to spruce up the sanctuary and children’s cry room – just in time to celebrate the 500th anniversary of the Reformation. Twenty-five volunteers participated in the event. 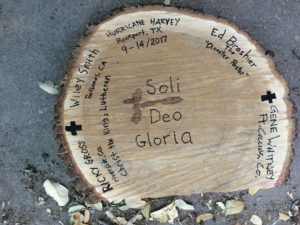 Through Southern District Disaster Relief Coordinator Pastor Ed Brashier the Southern District has provided the following to the Texas District. Saved the Members or Friends of the LCMS an estimated $84,000. An important function of churches today is to bring the local community into the body of Christ. Grace Lutheran Church in Pensacola, FL, has recently hired John Hanke as our Family Life Coordinator. John brings to us years of experience working with Lutheran churches. Things are back in full swing at Grace in Huntsville, AL. We welcome our new pastor and his family to our congregation. Rev. Russ Gipson was installed at an installation service on Sunday, July 30th, followed by a celebratory dinner reception. We are happy to see an increased attendance at our worship services!